Celebrating 100 years, the Historic, Fairmont Hotel Macdonald is Edmontons only four diamond Historic luxury hotel. The Chateau on the River distinctive guestrooms are well appointed with state-of-the-art amenities. The elegant meeting rooms offer the perfect venue for large or small groups. Stroll through the splendid gardens or visit our well equipped Fitness Center for a workout or spa treatment. Fully restored to its original grandeur, The Fairmont Hotel Macdonald offers all the amenities of a world class hotel with attentive, personalized service. 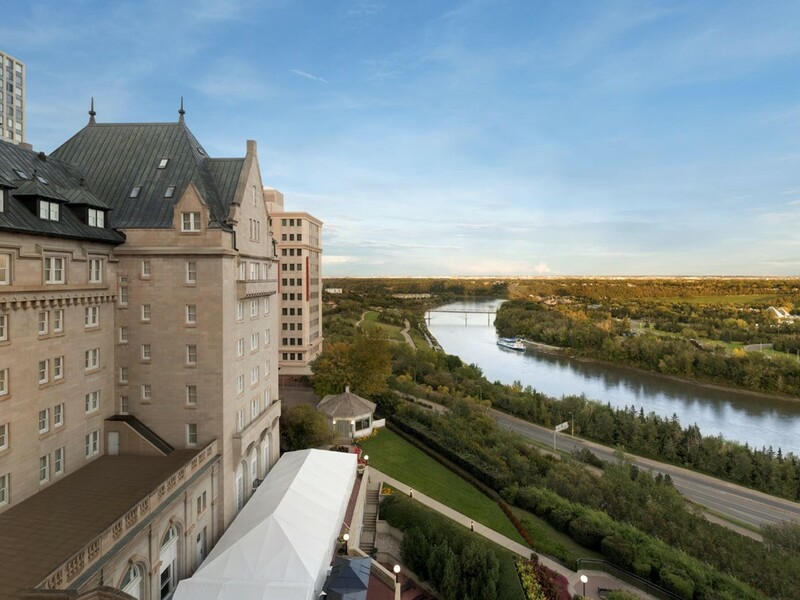 The hotel has 198 beautifully appointed guestrooms and suites with either a view of Edmonton City Centre or our View rooms which offer views of Edmontons River Valley, North Americas largest urban park land and the beautiful gardens. The Harvest Room beckons with a warm and vibrant atmosphere, enhanced by a magnificent view of the River Valley. Diners enjoy award-winning cuisine featuring regional specialties such as Alberta beef, game, freshwater fish, and local produce. The Confederation Lounge, an estate library-style lounge, with its plush chairs and welcoming atmosphere, is the best place to unwind with a beverage and admire the picture-perfect view of the North Saskatchewan River Valley.